What is integrity? Do you have it? Do you recognize it in others? 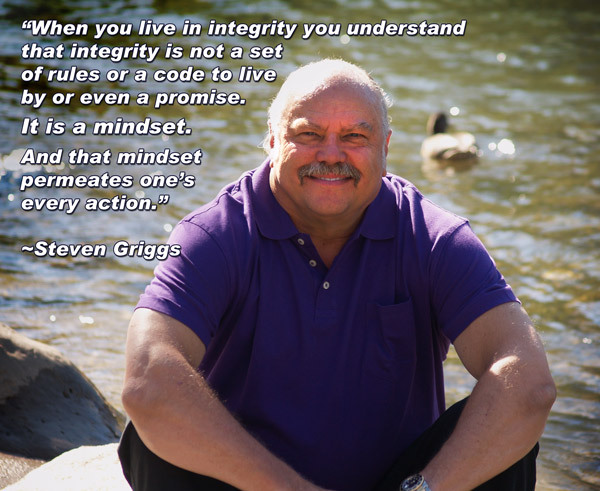 When you live in integrity you understand that integrity is not a set of rules or a code to live by or even a promise. It is a mindset. And that mindset permeates one’s every action. You don’t have to go out of your way to have integrity nor do you have to keep remembering to have integrity, when you understand and embrace integrity, it is the only way. This is not to say that one can become automatically full of integrity, sometimes you have it naturally and sometimes it takes a bit of time to ingrain it into your personal culture. the state of being whole, entire, or undiminished: to preservethe integrity of the empire. Each of the definitions above describes an aspect of integrity: By adhering to moral and ethical principles you remain sound and unimpaired in a state of undiminished wholeness. That was a long winded way to describe integrity but really it says it all. Living a life of integrity expands you. It makes you solid, whole. A lot of weight falls away and very little sticks to you. I believe it is a stepping stone to becoming more self-actualized, more in alignment with everything. Integrity starts with a very small step: keeping your promises. I’ve talked about this before- you must always keep your promises to yourself, no matter what. For example, if you have told yourself you’re going on a diet and will stay away from snacks and then find yourself craving a piece of candy, do you tell yourself “I’ll only have one and then I’ll get back on track tomorrow”? By doing this you are affirming to yourself that you don’t keep your promises. The bigger error was going on a diet in the first place. If you aren’t ready to keep the promise, don’t make it. When you are ready, you are ready. Until then, affirm to yourself that you keep your promises. If you really want a chocolate bar, tell yourself I’m going to eat an entire block of chocolate. And then DO IT, keep your promise and eat the chocolate! Maybe even have two, it may help you become less interested in chocolate for a while (or maybe not). The point is to affirm to yourself that you do what you say. From there expand your promises to other areas. If you have the thought of going to the book store on the way home but then start to talk yourself out of it, don’t. Go to the bookstore, even if only for 15 or 20 minutes. By “talking” yourself out of the first thought you train yourself to second guess yourself or to be unsure or even worse, to reconsider and do the “appropriate thing”, like go home. But by not being true to yourself in these many small ways you undermine yourself, you can actually build discord and frustration. So keep your promises. After a while it will be automatic. You won’t ever feel denied or frustrated because you aren’t taking care of yourself. You are keeping your little (or big) promises to yourself. I’m not saying to become this big insatiable, person with “needs”. These are just private little ways to talk to yourself, to take care of yourself. In fact don’t tell anyone you are doing this (most of the things I talk about should be kept to yourself as it serves no purpose, no one else will understand and you end up having to constantly explain or defend yourself….). By starting with yourself, it will expand outward into your daily life. You will find yourself being more clear and straight forward with people. It feels good. So start watching what you say and do. Keep your promises, big and small. There is really no difference between them. Remember- a promise is a promise.